My friends, I am discounting all the seamless pantyhose styles on my site because I am no longer going to buy hosiery from these brands (Golden Lady, OMSA, Gatta, and Trasparenze). Mainly this is because I am putting up this business for sale as you may have already heard through my newsletter. Stock up on what’s left, there will be no more. Both Gatta and Fiore brands are from Poland, with factories just a short train ride apart. They keep an eye on each other, copy each other, and so on, just like any good competitors. In general Gatta is more popular and has a wider selection. The price is quite similar. Today I realized that I still had one of the long time ago limited editions from Gatta called Sherry Ann. It’s been a while since I wore Gatta hosiery since I wear so much of other brands. 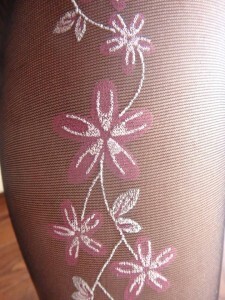 It is a sheer 20 den style with pink flowers along the side of the leg. Some of you who followed this blog, you probably saw this style already. It is no longer available for sale simply because I don’t have anymore of it. I also was trying on for photos some Fiore tights in 20 denier, same size and similar kind of pattern, to compare the fit and feel. Here I’ll just show Gatta tights since I already have so many photos of Fiore. Lycra content: Gatta has a little more lycra! I see that Fiore usually has 12% for such styles and Gatta has 14%. In my opinion higher lycra content results in a softer feel. Elasticity: Gatta proved to be more elastic. I tried size Large for both pairs and Fiore evenly stretched along my legs right away, but Gatta seemed to have extra material left over that rolled up on my upper thigh, later smoothing out as I continued wearing it. Toe reinforcement: Gatta has sheer toe, Fiore has invisibly reinforced toe. I rarely get runs, but I hear from other people that any kind of reinforcement helps with durability. This is all for now. As you see, both have some advantages, disadvantage, and features that may be important for some people. Celebrating my new shoes purchase! Today I bought two pairs of shoes and a purse. Here’s the sexiest one – a style by L.A.M.B. brand! I am only planning to wear it indoors for photoshoots, not outside. I took this photo today in my pool area while wearing a tunic top and a pair of off white Fortissima pantyhose. This video shows off Fortissima pantyhose by Gatta. Amazing quality! Available at the shop section. Fortissima pantyhose is the softest and strongest from Gatta line. If you’d be to choose only one style to try, that would be it. The company that owns the brand is called Ferax and it is located in a small Polish city called Zdunska Wola. Perhaps there is not much in that city except for that factory. That district in general has very well established textile industries.This beautiful and seductive video is an advertisement for a Polish brand called Gatta and for their run resistant Fortissima pantyhose. This brand dominates Russian and Polish market and is considered to be one of the most well-launched brands in Poland. Pantyhose advertised here is Fortissima, but probably more like in 30 den. I only so far tried 15 den and 20 den in Fortissima style. It came out around 2010 and I got my hands on it right away during my visit to Europe. Amazed by the quality, I kept on buying more and more of it for daily wear. It is run resistant, not to say completely run-free, but the quality is really good for the price, that’s for sure. Such properties are achieved by Lycra Fusion mechanism. A friend of mine told me that she ripped hers with the zipper from her boot by accident, but it didn’t run all over the place, so she returned home and stitched it. Still wears it, with boots of course. Another friend of mine, Michelle, likes this style because she finds that it fits comfortably around her hips. She’s got a bit of a fuller figure. Have you tried it? I’d love to hear your comments!